Our FSX server, which includes Live ATIS and FlightDesk, is offline. We are engaging our ISP to determine the extent of the issue and will post additional information as it becomes available. Due to the interaction between our website and FSX server, the website will be loading more slowly than usual until the FSX server is back online. Early information, subject to additional investigation, indicates that the server may be offline for several hours, potentially into tomorrow. There are no indications this was anything other than a technical malfunction. As soon as we have an expected resolution time, we will post an update. Are the Teamspeak server's related to this issue as well? 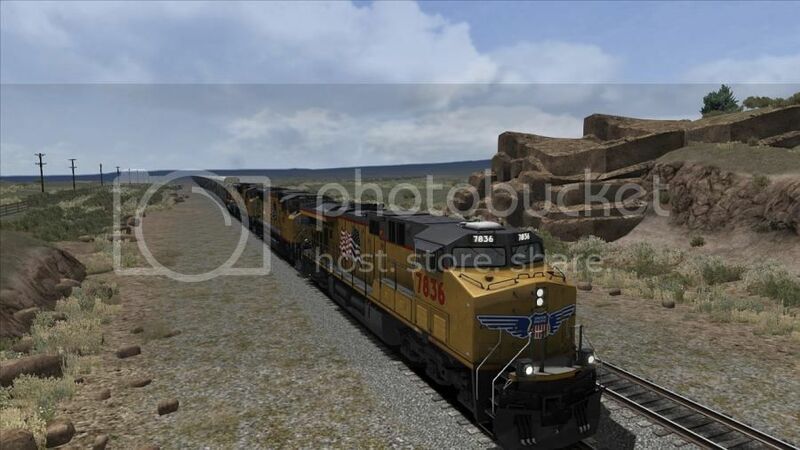 BVA's TeamSpeak servers are hosted on the FSX server location and therefore are offline as well. As of around noon ET today, we don't have much more information to share. There are a lot of unknowns at this point. That being said, we'd like to provide what information we have in the interest of transparency. Our ISP has been very helpful and responsive in working the issue and are attempting a fix now that we hope will bring the server back online. There is no timing estimate available; it's detailed work that could be finished in a few minutes, or several hours. We also aren't sure about the outcome: what the ISP is doing could completely restore our server, or it could mean we have to start from a new operating system and re-install FSX. The good news is that we stand to lose very little in either case. The only real impact we've identified so far is the amount of time it will take to get things back up and running. We understand that this is very frustrating and we're working extremely hard to get back up and running as quickly as possible. Depending on the outcome of the ISP's work, "as soon as possible" could be tonight, and it could be at some point this weekend. I'll continue to post status updates here as they become available. I'm truly sorry for this disruption and hope we can get it resolved as soon as possible. Gentlemen, we have bad news. We have lost the hard drive. We are uploading files as we speak, as fast as we can, but it may take a day or two to restore full service. We're starting from a clean system meaning that we're going to lose a lot of information. TS will be up soon but FSX will take a while longer. Stay tuned for more updates but realistically do not expect FSX service till tomorrow or Saturday. "Join the mile high club? I guess you could say things are getting Cirrus"
The more time you have in the air, the more air you have in your wallet. During this outage, the A-Team would like to remind you of some key point regarding your personal safety and sanity. The most important rule is DO NOT GO OUTSIDE. Years of BVA will make you sensitive to sunlight and incapable of social interaction. It is recommended that members continue to humour each other and provide comical relief in the Random & Off Topic Discussion Forum, throughout this period of environmental, social, economic or structural collapse, despite this disruption of apocalyptic significance. Finally, please observe the fact that the above message should not be taken literally in anyway. We apologies for the outage, but please respect that members of the A-Team are working hard to restore services as quickly as possible. Air Traffic Controllers; Once Teamspeak has been returned, controllers may join in an Apocalyptic Special Edition of ATC Music Jeopardy. Sometimes I do things. But mostly I don't. now that's something im in for! Am I the only one finding it impossible to find temporary friends and a life for this outage period? Anyway Jeremy (jrvalent) and I have come with the perfect solution to use you free time productively! thank god . i thought i was the only one, at first i thought it was my computer but not. TheNavyReapers looked destined to win, being ahead at the end of the main round. However, trying to play it safe by not betting did not work for the Reapers: Nate, Cody and Josh Jnr. all bet high and it paid off when they overtook TheNavyReapers, resulting in Cessna_172_KBOI taking the win at the last moment in Music Jeopardy - a substantial win given that Nate had only joined halfway through the session, and was 350 points off the lead at the end of the main round. Also worth noting was Bluewarrior4185, who took the lead for the majority of the main round, and finished a respectable 2nd. jc080398's bet didn't pay off when he decided to risk it all, and failed on the Final Jeopardy question; he ended up with no points, tied with N555UF, who had been idle the entire game. 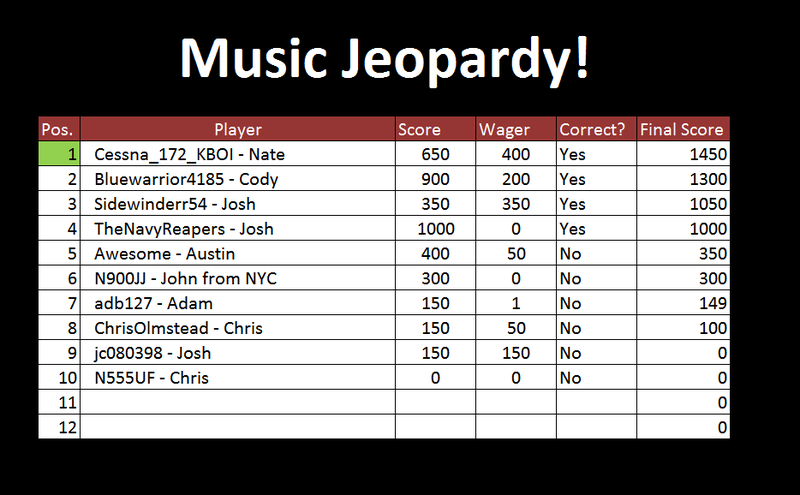 Round 2 of Music Jeopardy coming soon!